Bengaluru: Farmers and activists from pro-Kannada outfits protested in various parts of Karnataka against the Supreme Court’s directive to the state government to release Cauvery water to Tamil Nadu. According to reports, Chief Minister Siddaramaiah convened a meeting of legislature leaders and MPs in Bengaluru to discuss the issue. The Siddaramaiah government is set to hold a meeting with floor leaders of all parties in the state legislature, MPs and district-in charge ministers on Tuesday evening to take stock of the situation. The Cauvery Hitarakshana Samithi (Cauvery protection committee) called for a bandh on Tuesday in Mandya, even as farmers and others hit the streets protesting the top court directive to release 15,000 cusecs of water per day for next ten days to Tamil Nadu. “We have decided to call for Mandya bandh tomorrow to protest against the court direction to release cauvery water to Tamil Nadu when there is hardly any water left at our side of the river,” Samithi President and former MP G Made Gowda told reporters late on Monday at Mandya, some 100 km from in Bengaluru. Gowda also urged the government to file a review petition in the Supreme Court. The farmers’ leader also warned the government that it would face strong agitation if water was released to Tamil Nadu. Reports said that protests broke out in other parts of the state including Chamrajnagar, Mysuru and Hubballi with farmers and pro-Kannada activists demonstrating against the order of the apex court. 700 state buses were taken off the roads as a safety measure, said reports. Effigies and posters of Tamil Nadu Chief Minister J Jayalalithaa were burnt in some places, while a group of farmers tried to enter the KRS Reservoir in Mysuru but were stopped. ‘Karnataka Okkuta’, an outfit led by Vatal Nagaraj, called for a ‘Karnataka bandh’ on September 9. Workers of the pro-Kannada outfit held a protest in Bengaluru. Noting that the samba crops in Tamil Nadu would be adversely affected, a bench comprising Justices Dipak Misra and UU Lalit on Monday directed Karnataka to ensure supply of water to Tamil Nadu. On September 2, the Supreme Court had made an emotional appeal to Karnataka saying ‘live and let live’, after Tamil Nadu brought to the notice of the court that the Chief Minister of the neighbouring state has said that not a drop of water will be released to it. In a recent plea, Tamil Nadu had sought a direction to Karnataka to release 50.52 tmc feet of Cauvery water to save 40,000 acres of samba crops this season. 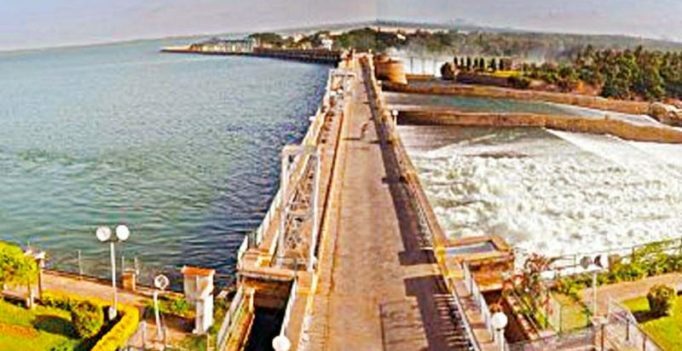 In reply, Karnataka had said it has a deficit of about 80 tmc feet in its four reservoirs.